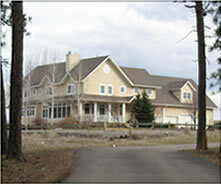 Finish exterior - siding, roofing, masonry, exterior painting, decks, etc. Periodic walk-through points with client to ensure construction is on track with client expectations. Alterations or deviations from the scope of work detailed in the fixed price contract will be executed only upon written order and will become an extra change over and above the contract amount. Changes will only be executed when a price is agreed upon and both parties have signed the change order. Remodels and additions may be done on a time and materials basis.